Complexion biases aren’t new. Racism is ingrained in humanity, the way it projects the fairer complexion to be superior to those who have a dull or darker complexion. We are a country which loves fair skin. It no longer surprises us when mothers tell their daughters that they need to preserve their skin tone otherwise they will not get the perfect match. And further instances of the deep-seated racism that we encounter in our day-to-day life is a direct reflection of our insecurities, of our inability to accept ourselves and be comfortable in our own skin. In this deleted scene from Dilwale Dulhaniya Le Jayenge posted by YRF in 2009, we get a taste of the absurd ideas of fairness enforced by our families and shoved down our throats. And sorry boys, but the women would relate to this since research matrimonial sites have proven that Indian men *too* prefer a fair-skinned woman over a dark-skinned one. 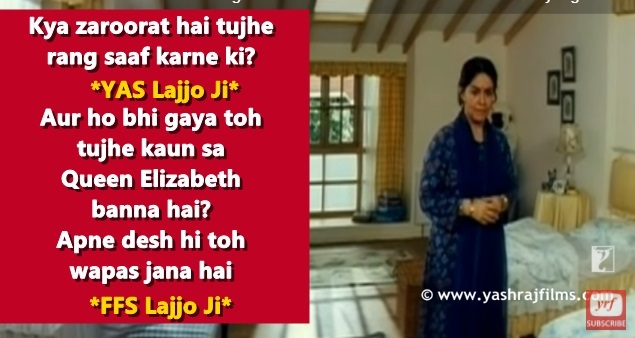 In this scene, which was to be an alternative introductory shot for Kajol who plays Simran in the movie, Lajjo AKA Farid Jalal (Simran’s Mom) literally tries to reinforce every age-old racist and sexist trope there is. The scene has Simran bent over a steamer, when her mother chides her for trying to become fair. So far, so good. But then Lajjo ji rants about how Simran need not steam her face to become fair (EXCUSE ME, THAT’S NOT WHAT STEAMING DOES), because otherwise, she would not get an ‘appropriate’ match. Why? Because Indian men preferred someone to look “their colour”. Please, what? 2) Ugh, woman! Somebody tell Lajjo ji to please take a couple of seats. 3) Translation: Indians like being brown. The whole fairness cream thing we spoke about is a hoax created by China. 4) And then there’s this bit of mindless jabbering.